Tshogpon Jigme Zangpo launches the Third Annual Report of the NAB. 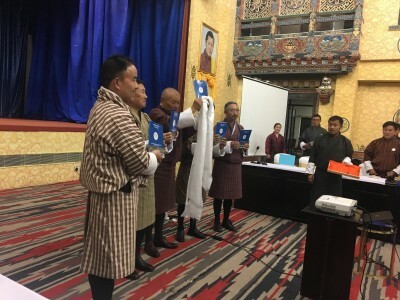 Tshogpon Jigme Zangpo with Dokcho Gothrip Dr. Pema Gyamtsho, during a simple farewell dinner hosted by the staff of National Assembly Secretariat held on 30 July 2018, launched the NAB’s Annual Report for FY 2017-18. The Report, which is a third issue, reflects the activities undertaken towards achieving the vision and mission of the National Assembly of Bhutan, including the technical and financial prospects of the year. The report also provides a highlight of the Second Parliament and the role of Opposition Party.